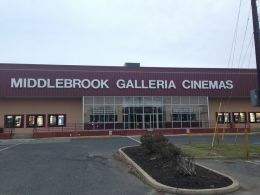 Opened October 21, 1994 as the Middlebrook Galleria Cinema 10.
formerly Clearview's Middlebrook Cinema 10, which was renamed to Bow Tie Middlebrook Galleria Cinema 10 when Bow Tie Cinemas acquired Clearview Cinemas in May 2013. Bow Tie Cinemas ended its lease in October 2014. It was taken over by Netherlands-based Cine Grand on November 7, 2014. It closed in February 2019. This movie theater is near Interlaken, Tinton Falls, Ocean, Asbury Park, Oakhurst, Allenhurst, West Allenhurst, W Allenhurst, Loch Arbour, Deal, Neptune.